The Chinese military has tested the latest iteration of its stealth fighter in an attempt to compete with U.S. and other Western stealth fighters. The latest version of the J-31, which has been renamed as the FC-31 Gyrfalcon, flew for the first time on Friday, the AFP news agency reported, citing Chinese state-run media outlets. The J-31, described by the Chinese military as a “fifth-generation” twin-engine jet, was designed as an answer to the United States’ F-35, considered the world’s most advanced fighter plane. 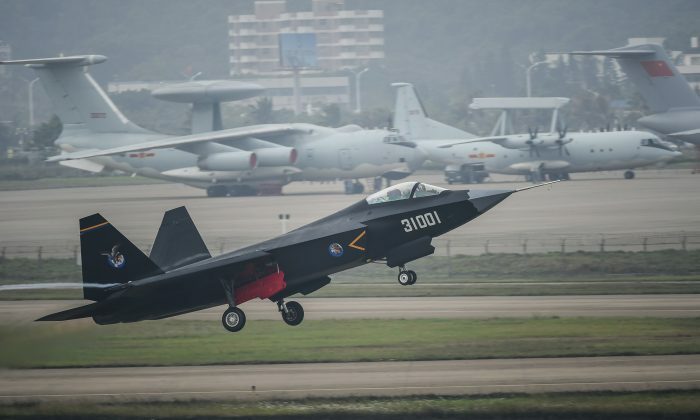 Chinese aviation expert Wu Peixin said the FC-31 has “better stealth capabilities, improved electronic equipment and a larger payload capacity” than the previous version that made its debut in 2012. China has been accused of copying and stealing the designs from Russian fighters, while analysts have said that the FC-31 bears a strong resemblance to the F-35. The FC-31 is expected to sell for about $70 million, the AFP report said. In 2009, Chinese cyber-criminals allegedly hacked into U.S. systems and acquired information on the F-35 program. The U.S. National Security Administration (NSA) has said that Chinese intruders stole some 50 terabytes of data related to the F-35 and other U.S. aircraft. Earlier this year, a Chinese businessman pleaded guilty to conspiracy to hack computer networks of U.S. defense contractors to get sensitive data on the F-35 and the F-22 Raptor. Court papers released at the time said that Su Bin, also known as Stephen Su, worked with two Chinese hackers who “engaged in clandestine computer and network reconnaissance and intrusion operations,” reports at the time said. He was sentenced to 46 months in prison. “These activities have serious consequences for the national security of our country and the safety of the men and women of our armed services,” said Assistant Attorney General for National Security John P. Carlin in a Department of Justice statement.